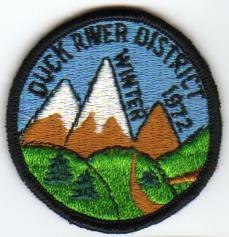 So why do we have two 1972 Duck River Winter camporee patches? They were likely not for the same school year. Most likely one was held in January, 1972 (when Winter camporees are most often held) for the 1971-72 year, and then the other in December of 1972 for the 1972-73 year. Or possibly one was ordered for the January, 1973 camporee but was mistakenly ordered with 1972 on the patch. This occurred with the Middle Tennessee Council 1991 Winter camporee (there are two dated 1990 and not one dated 1991 because of that error). Or perhaps they made two patches for the same event. If you can shed any light on this issue, please e-mail me at abw11365@comcast.net.